This adorable clown performed at the Ringling Barnum & Bailey Circus we attended last June. Lydia promptly fell in love. So much so that we had to play "green haired boyfriend" games for months. She has that picture as the wallpaper on her iPod. And, a year later, she still remembers him fondly. 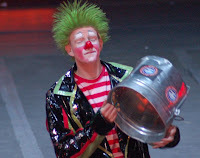 And hopes that he will perform again this year at the circus! Yep! The circus is coming back to Phoenix this June! Opening night is June 22, 2011 and they'll be in town until June 27, 2011. If you want to get a sneak peek of what to expect - click this link for a video! It's an all new show called "Fully Charged" and it looks like a ton of fun. We only hope that the green haired clown will be there, too!! Are you in the Phoenix area? I'll be posting a discount code AND a special giveaway in the next couple days -- so come back soon!